Always on the lookout for interesting wood to turn, I found a small standing dead cherry tree in the woods and finally got around to taking it down. As it hit the ground, most of it shattered in a pile of rotted wood. However, I was able to find 6-8 candidate pieces towards the root end of the tree. Cutting them into a variety of sizes for bowls , vessels, and urns, I was suddenly anxious to mount one of them on the lathe and see what I might get out of it. But first, I treated the cut ends of each piece with wax to minimize checking. Even though the wood was long dead and I didn’t have to worry about green wood shrinkage, I knew there as a lot of rain moisture in the wood that could still cause a lot of splitting as it dried out. I rip-cut 2 pieces in half, leaving the rest remaining as full-log pieces for crafting some new ideas. Here’s my challenge blank; a small half-log with a lot of punky, soft spots that I knew would haunt me later on. Rip cutting the piece gave me a clue to how the wood would look, as it already was a salmon pink color, with a small amount of edge spalting and coloring. 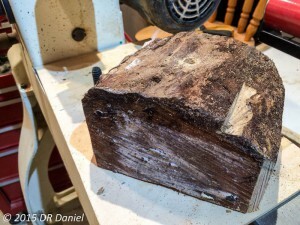 I decided the base would be at the pith side of the log. I drilled a hole in the bark side of the piece to accept a screw center, mounted that into a scroll chuck, and brought up the tail stock for security. 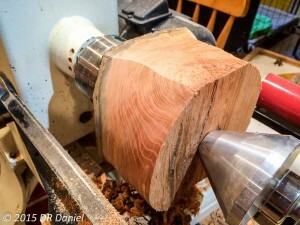 As it turned out, the bark side of the log was so soft, it was a challenge to get a secure mount on the chuck. For future pieces, I’ll use my 3″ forstner bit to get down to solid wood, where the screw has a secure hold and the chuck jaws are landed solidly. Another option would be to mount it between centers, using a steb-center drive end for safety. However, this piece was just too soft to safely mount between centers. I prefer the solid mounting of the screw center, knowing that the log is held in place with the screw threads as well as the effect of having a pin (the screw) holding the piece laterally. You can see just how soft this wood is by looking at how far in the tailstock has disappeared into the blank. That edge will eventually have a tenon to hold the blank in a scroll chuck, so I wasn’t too worried about a hole revealing itself in the finished piece. Fortunately, with the exception of the pith area and the bark edge, the wood was acceptable for turning. Even so, I had a huge amount of tear out – something that simply can’t be avoided with wood that is halfway between fresh and rotten mulch. Each growth ring has very soft spring wood that leaves hundreds of opportunities for tear out. It’s hard to see the tear out in the picture above, but it’s there. Once the piece was shaped, and found I had to spend a huge amount of time shear-scraping the piece. This was about the only way I could possibly hope to get a smooth, polished piece. As it turned out, the results turned out far better than expected. Her e, you can see the remarkable salmon color, and the green accent coloring near what was the outer edge of the log. I still need to finish polishing the piece and applying a few coats of oil and wax before reversing the bowl and removing the tenon. That, and signature and date, and we’ll call it finished. Of course, the piece is for sale (as is almost all my work). Look for it on my Etsy site soon. Quit reading and go make some shavings! Very nice! What kind of product did you use on the wood to smooth out the difference between heartwood and sapwood? 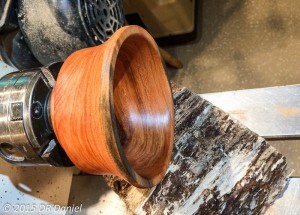 The bowl has no finish at all. What you see in the picture is polished wood ready for protective finish such as oil or lacquer. The salmon coloring goes throughout the entire piece and is quite remarkable – the pictures don’t do it justice. This is typical of cherry.